Each month we travel to one of EFG’s national membership associations and discover their main activities and challenges. In June we have continued our journey to Italy and talked to Francesco Peduto, the President of the Italian National Association CNG. Francesco Peduto is an expert geologist in soil protection and civil protection. He addressed these issues both at a professional level, also with responsibility roles during the hydrogeological emergency in Campania (Southern Italy region) in 1998 (Sarno’s disaster), and at a scientific level, producing publications, geological maps and informative articles. 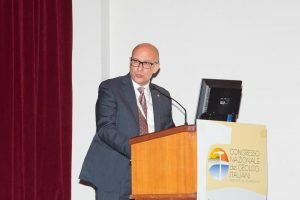 He has been President of the Italian National Association (CNG) since December 2015 and he is a member of the “Control Room” of ITALIASICURA, the Mission Structure of the Italian Government against hydrogeological instability and he is a member of the National Observatory for Post-Earthquake Reconstruction Central Italy 2016 (also set up by the Italian Government).